A little bit of luxury for you this week. I’m still sticking with the French theme, but it’s a little less obvious than in previous weeks. This week’s recipe is inspired by a newly acquired book which demonstrates that food allergies or intolerances need not signal a lifetime of dull or dismal food. This is the latest pubication by Philippe Conticini, creating mouthwatering desserts and treats that are both gluten free and dairy free. Although I purchased my copy from the French Amazon site a few months ago, it is now available with just UK shipping charges here, or order through your local bookshop. Alas, it is only available in the original French, but anyone with O-level/GCSE French and a working knowledge of baking will manage easily. Sidebar: for the digitally inclined, there is a free Translate app that will allow you to photograph text with your phone, which it will then scan and translate on the go. Also, Chef Conticini has many of his recipes freely available on his website here, as well as numerous demonstration videos on his Facebook page here. The first recipe in the book is for a kind of chocolate nut sponge, and it is filled with a ganache and glazed with a slightly thinned version of the ganache. It is delicious! It is also very hard to believe it is both gluten and lactose free. I was so impressed with the ganache, I thought it deserved a starring role, so here it is in a very elegant and sophisticated tart. Gluten and dairy free chocolate is available in supermarkets – I found both milk and dark chocolate in Morrisons. This tart is made up of bits and pieces from different recipes, tweaked to fit in with my overall idea: I like to think of it as the Lego™ approach. The praline paste is Philippe Conticinis, as well as the ganache – I’ve not messed with either. I’ve tweaked the sweet pastry recipe by adding cocoa (reducing one of the flours) to make it chocolate. I’ve used a long, rectangular tart tin, but any shape will do. Since everything tastes so rich, the tart doesn’t have to be very deep and you could probably stretch the pastry to a 24cm flan tin. Otherwise, use a 20cm flan tin and, exercising your will of iron, cut the slices very thin. NB Because it is a bit of a Faff™, this deliberately makes a LOT of praline. However, it will keep for months in the fridge if necessary. If you really don’t think you’ll use it – I mean, it’s not like it tastes AWESOME or anything – consider making a half batch. Put the sugar and the water in a pan over a low heat until the sugar has dissolved. Bring the syrup to a boil and when the temperature reaches 118°C, add the hazelnuts and almonds. Stir the nuts in the sugar, making sure that they are thoroughly coated. This movement will also cause the sugar to crystallise. This is fine. Continue stirring to keep the nuts from burning. Eventually, the sugar will melt again and turn a deep and warm caramel colour. At this point, pour the whole mixture onto baking parchment. Before it cools, pull the nuts apart using a couple of forks, so that they don’t set in a solid lump. This will make processing them easier. When the caramelised nuts are cold, break them up either by hand or by battering them with a rolling pin and transfer to a food processor fitted with the cutting blade. If you want to use some of the nuts as decoration, as in the photo, set some aside before the mixture becomes paste. Process the nuts into a smooth paste using a series of short bursts with the blade. If you keep the blade moving for too long, it will heat up the paste, so short stints are best. For a long time it will seem like you’re just making a racket with the machine, but it will eventually break down into smaller pieces. When the mixture is smooth, transfer to an airtight box and store in the fridge. This recipe uses clarified butter. Before everyone starts shrieking dairy, let me remind you that clarified butter is pure fat, WITHOUT any of the dairy solids. If you’re not convinced, as an alternative you can use Indian ghee or coconut butter. Use a little clarified butter to grease your tin and shake over some cornflour (to help keep the pastry from sticking). Put the butter and the dry ingredients into a food processor and blitz until the mixture resembles breadcrumbs. Whisk the yolk into the beaten egg and add gradually to the dry ingredients until the mixture comes together. It might not come together in the bowl, only resemble damp crumbs, but it will hold once tipped out and pressed firmly. Roll out thinly and use to line your prepared tin. Alternatively, just use the damp crumbs into your tin and press into the sides and base until covered. I opted to roll the pastry and got it impressively thin, but then I found I couldn’t move it across into the tin in one piece, so I just patchworked it together. Line your pastry with baking parchment and add cooking beads/rice. Bake until the pastry is fully cooked (20-30 minutes). Set aside to cool. NB Your pastry might crack as it cools. Fear not. Just melt some GF DF chocolate and literally paint over the cracks. And everywhere else if you like. Put the tart shell in the fridge to set. The layer of chocolate will help keep the pastry crisp underneath the rich filling. Break the chocolate into pieces and melt in a bowl over warm water. Heat the milk and slowly add to the melted chocolate, stirring constantly until fully combined. 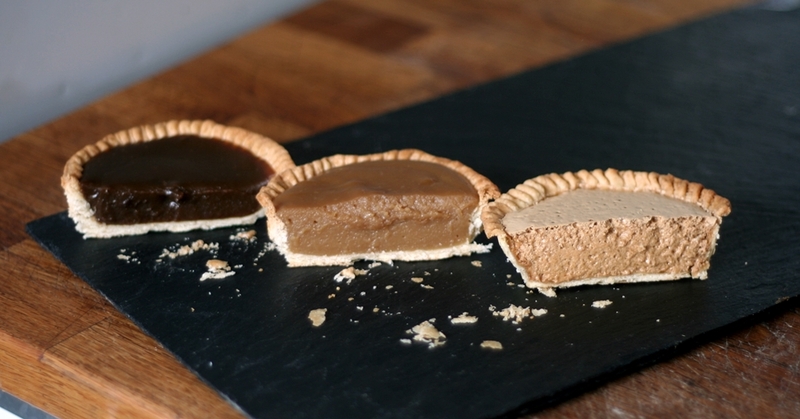 Add a layer of praline to the cooled tart shell. How much is entirely up to you. I am a big fan of its rich taste, but then again, a little does go a long way. I spread a 5mm layer which is enough to give the flavour, but doesn’t overpower. If the praline is cold and too stiff to spread, zap it for a few seconds in the microwave to soften. Pour the warm ganache over the praline paste and smooth. You can also tap the tin lightly on the work surface to get the ganache to level out. Put into the fridge to set. Once set, sprinkle over the finely chopped praline if using. If not eating immediately, cover lightly with cling film – try and keep it from touching the ganache – and store in the fridge. Allow the tart to come to room temperature before serving. Coffee and Walnut is one the best flavour combinations you can enjoy. Of course, it helps if you’re a coffee fiend like myself. The tannins in, and astringency of, the walnut skins both help to balance out any sweetness and also complements the bitterness of the coffee. If, also like me, you don’t have much of a sweet tooth, it is a delicious step back from too much sweetness. Mary Berry’s Coffee and Walnut Cake recipe is the best cake version of this classic combination. As part of the audition process for season two of The Great British Bake Off, groups of applicants were summoned to a test kitchen and asked to bake Mary’s Coffee and Walnut Cake under filming conditions, to determine both real-time cooking ability and whether you could whisk eggs and answer questions at the same time. Mary Berry’s Coffee and Walnut Cake is also the cake that I bake for others to enjoy: for the school summer fete, to thank a neighbour for removing a tree that was damaging our fence, for my dentist to apologise for missing an appointment, for the lads at the garage for going that extra mile. It’s the kind of cake that doesn’t sound very interesting, but when tasted, invites a wave of nostalgic memories of traditional tea-times. This recipe is a variation of this classic flavour combination, in the form of a tart: sweet walnut pastry, coffee and walnut frangipane, a layer of coffee caramel over walnut halves and decorated with candied walnuts. The original recipe wasn’t such a coffee/walnut feast. In fact, it didn’t have any coffee in it at all. I played around with adding it here and there and eventually came up with this variation. The appearance also required attention, which isn’t exactly one of my strengths. In this year’s Bake Off, Mary Berry has found a word to describe bakes of less-than-ideal appearance: they are being referred to as ‘informal’. The first iteration of this recipe was definitely informal – see below. It didn’t help matters that I decided to cut it whilst still warm. During the filming of the Bake Off, I’d apparently told Mary Berry that “I don’t do dainty”. Whilst I’ll be the first to admit that this tart still isn’t dainty, I’ve tried to make it a step up from ‘informal’, out of my desire never to earn reproach from the imaginary Mary Berry that will forever be looking over my shoulder, i.e. made an effort to make the pastry thinner, allowed the caramel to cool down before cutting into the tart, less icing sugar, more candied walnuts. In a week where Mary Berry decided to leave the Bake Off, I’d like to acknowledge my very great affection and respect both for her and her gentle encouragement to always make an effort to finish things nicely. If you’re not a fan of coffee, you can leave it out altogether – it will still be delicious. 80g walnuts – ground fine in a food processor. Grease and line a 20cm tart tin with baking parchment. Blitz the butter, sugar, walnuts and flour in a food processor until it resembles fine breadcrumbs. Whisk together the egg and the yolk. With the food processor running, gradually add the egg, little by little, until the mixture comes together into a ball. NB There is moisture in the walnuts and the butter, so you might only need a little of the egg. Do NOT be heavy-handed adding the egg, as this pastry is rather a challenge to work with when made well – too wet and it verges on nightmarish. Roll the pastry thinly (5mm) and use to line your tart tin. It is very fragile, so you’re unlikely to be able to drape it into your tin in a whole sheet. The good news is, it is very forgiving if you just want to patchwork it. Put your pastry-lined tin in the fridge or freezer to chill for 30 minutes. Trim any excess pastry from your tin, line with parchment and baking beads/rice and bake blind for 10 minutes. Remove parchment and bake for a further 5 minutes to firm up the inner surface of the pastry. Reduce oven temperature to 180°C, 160°C Fan. Whisk the eggs and sugar together until light and foamy. Pour mixture into the blind-baked pastry shell and bake for 15-20 minutes until set and lightly browned. When the tart has cooled, arrange the walnut halves neatly over the top. Put the sugar and water into a pan over medium heat. I prefer my non-stick frying pan for this task. Allow the sugar to dissolve, then turn up the heat and allow to boil until a golden caramel colour is achieved. Remove from the heat and whisk in the cream, butter and coffee. Pour the caramel over the walnut halves. I found it best to spoon a little over each nut, to ensure an even coating, then to drizzle the remainder into any gaps. Allow to cool, then chill in the fridge until required. Dissolve the sugar in the water and bring to a boil. When the sugar begins to caramelise, add the walnut halves and stir over medium head until coated. Lift the sugared nuts from the pan with a fork and set onto parchment to cool. Dust lightly with icing sugar and top with the candied walnuts. Here’s a recipe I came up with for a charity a couple of years ago. Seeing as the weather has been a bit on the brisk side lately, I thought it would be the ideal treat to enjoy all snug and cosy on a Sunday afternoon. Or at 11pm, straight from the fridge. Your call. 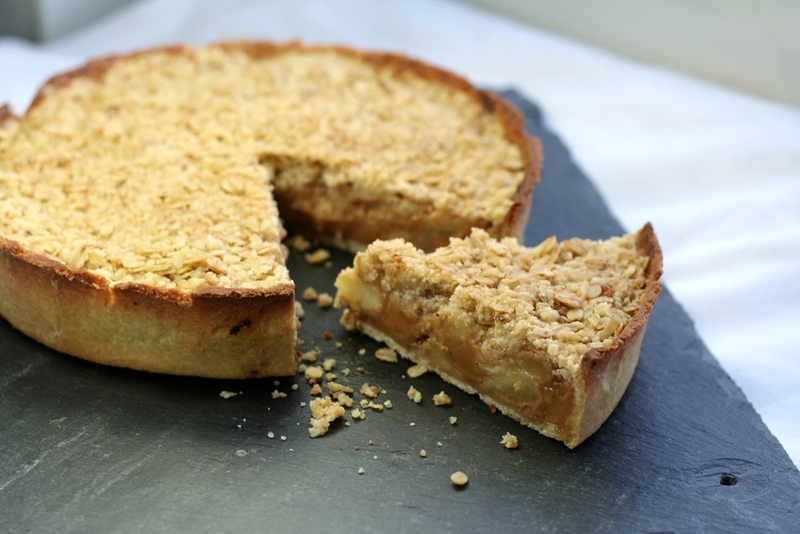 It’s a tart of contrasts: crumbly pastry, crunchy oats, rich caramel and sharp apples. I love it! And with a tin of caramel in the cupboard, it comes together in just a few minutes. Probably gone is as many, too. Short and sweet. Like this post. Put all of the pastry ingredients except the egg into the bowl of a food processor and blitz until the mixture resembles breadcrumbs. Whisk the egg, then gradually add to the mixture while the motor is running until the mixture comes together in a ball. Tip out the pastry and knead a little until smooth. Wrap in clingfilm and chill in the fridge for at least 30 minutes. Grease a 20cm loose-bottomed tart tin. Roll the pastry out thinly, about 5mm. Line the tart tin with the pastry, easing it gently into the sides of the tin. Do not trim the excess pastry, but let it hang over the sides of the tin. Remove the tart tin from the fridge and prick the base of the pastry with a fork, to prevent blistering. Line the tin with parchment and pour in some baking beads/beans/rice. Blind bake the pastry for 10 minutes. Remove the tin from the oven and lift out the parchment paper and its contents. Return the tin to the oven for another 5 minutes to allow the pastry to finish baking. If the edges of the pastry seem to be browning too much, cover them with foil. Brush the inside of the pastry with whisked egg white and return to the oven for three minutes to dry. Set aside. Tip the mixture into a bowl and stir in the oats and salt. Set aside. Peel the apples and cut each into 8 slices. Remove the core and chop each slice into chunks – about 5-6 per slice. Add the chunks of apple and cook gently over a moderate heat until the apples have softened and any juice has evaporated. NB Bramley apples WILL reach a point where they just collapse in a pile of fluff if you cook them fully. You need to stop before this happens. They will continue cooking in the oven, so don’t worry about making them soft, it’s making sure the excess juice evaporates that is important here, otherwise you’ll get soggy pockets of apple in your tart. Add the caramel and stir gently until thoroughly combined and warmed through. Pour the caramel and apple filling into the pastry shell and smooth over. If you’ve not already done so, cover the edges of the tart with foil to prevent them from becoming too brown. Return the tart to the oven and bake for 20-25 minutes until the crumble topping is crisp and golden. Cool in the tin for ten minutes. Trim the pastry edges neatly with a sharp, serrated knife, then carefully remove the tart from the tin and cool on a wire rack. Serve warm or chilled, with cream. Here’s an example of how a passing comment I read turns into something delicious – which I find even more enjoyable for it being over 250 years old! William Ellis was a gentleman farmer in Hertfordshire for most of the early 18th century. He was passionate about agriculture and husbandry and wrote extensively about his life and experiences. His reputation seems to have suffered somewhat both during his lifetime and afterwards, as his efforts to make money by writing about his knowledge of country matters was looked down on by ‘true’ gentlemen. Nowadays, his work is regarded in much higher esteem. Ellis’ The Country Housewife’s Family Companion (1750) is delightfully scatty, wandering off on digressions and anecdotes at every opportunity.The inspiration for this recipe came from the final paragraph of a section on puddings, vinegars and savoury pies (I told you it was scatty!). The original mentions a mixture of pumpkin and apples, however, it wasn’t pumpkin season when I first read it, and what I had on hand was an early season butternut squash, so that is what I used. Paired with some fluffy Bramley apples and just the slightest amount of sugar, this pie is light and refreshing, moist enough to hold it’s shape, but not so soggy as to ruin the pastry. Since modern Bramley Apples are probably much juicier than those available in the 18th century, I have included a little cornflour to thicken any excess liquid. 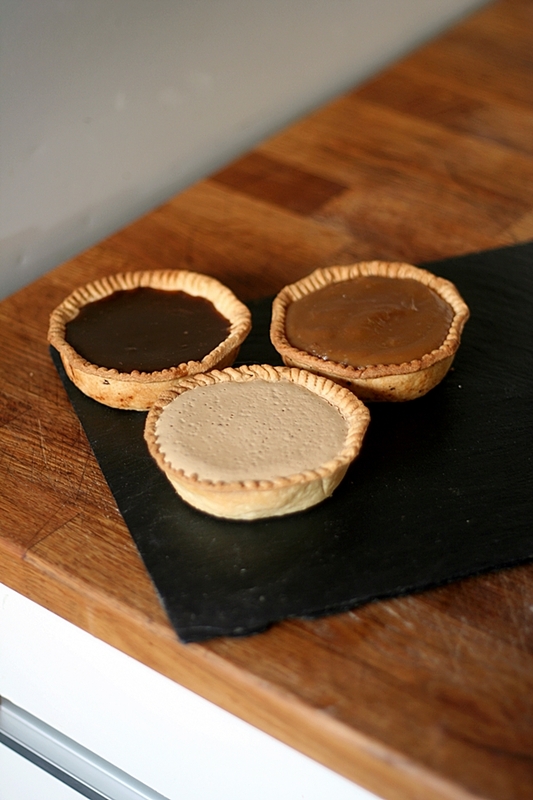 When it comes to the pastry, you have several options – obvs! The first time I made this I used a butter puff pastry, top and bottom. This decadence worked deliciously against the, lets face it, rather spartan filling – but the sharpness of the apple, the sweetness of the squash and the flaky crispness of the buttery pastry were truly a delight to savour. 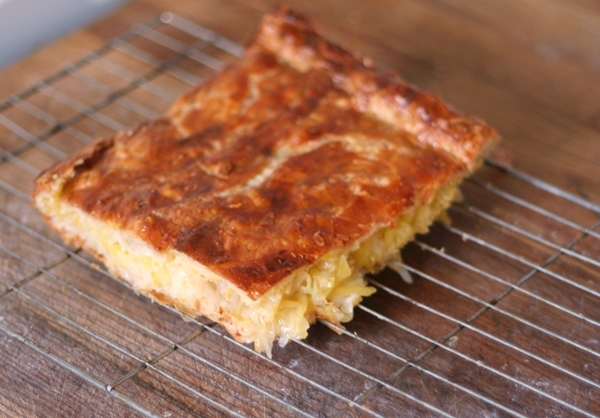 You could extend this flaky buttery-ness by opting for filo pastry. Alternatively, as in the photo above, mix-and-match with a shortcrust pastry for the bottom and sides and a puff pastry lid. If you’re planning a deep dish pie, then this would be your best option, as the shortcrust will hold the sides up better than puff – a large, flat pie is ideal for using butter puff pastry. Rather than have a list of vague quantities to cover all the pastry and pie size options, I’ve decided to go with the deep dish pie, as there are a couple of details that require a little attention in order to get the very best results. Roll out the pastry and line a 24cm tart tin. Prick the bottom of the tart with a fork to prevent blistering. Line the pastry with baking parchment and weigh it down with rice, dried peas or baking beans. Bake for 10 minutes, then remove the parchment and weights. Brush the inside of the pastry with lightly beaten egg-white and bake for a further 5 minutes. 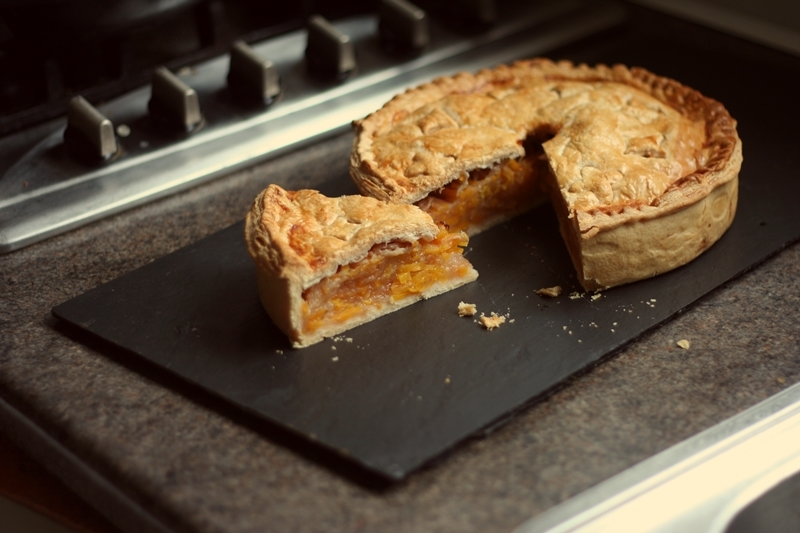 Set pie aside and raise the heat of the oven to 220°C, 200°C Fan. Toss the apple and squash together. Mix the sugar and cornflour together and sprinkle over the filling and toss again. Add the filling to the blind-baked pastry case and press down firmly – there will be some shrinkage during cooking, especially when using Bramley Apples, and you want to try and minimise any possibility of a huge gap opening up between the pastry lid and the filling. If your butternut squash is rather mature, and doesn’t seem very moist, add 2-3 tbs water over the filling before you add the pastry lid. Damp the edges of the pie and lay the sheet of puff pastry over the top. Press together firmly and crimp the edges. Cut a 1.5-2cm steam vent in the centre of the pie – I find a plain, metal piping nozzle is the best/neatest way to achieve this. This will also help indicate whether the pie is cooked, as the filling will be visible through the hole and a shred or two extracted and tasted if necessary. Decorate with pastry scraps as appropriate. Brush the whole lid with milk and sprinkle with caster sugar. Put the pie onto a baking sheet and bake in the hot oven for 15 minutes, then reduce the heat to 170°C, 150°C Fan and bake until the filling is cooked, 35-45 minutes more. NB The juice will be visible bubbling through the vent hole when cooked. If the lid is browning too much, cover it with a sheet of either foil or baking parchment. Remove cooked pie from the oven and set aside to cool. This is the very minimum amount to still achieve a sweet pie. If your apples are especially sharp, add more sugar, but remember, the sugar will also draw out the juice from the apples, so add a little more cornflour as well to compensate.